When I was in college, I worked a variety of different jobs. I worked in the special collections library, I taught dance, and I also worked in a scrapbook store. My mom never wanted me to work during college, though. In fact, she once told me she would pay me not to work. She felt that college was a time where I should be focusing on my studies and not taking on extra responsibility. Every Saturday during my freshman year of college, I was at the special collections library at 9:00 A.M. I didn’t even schedule classes that early during the week, and I’m so not a morning person. However, I loved my job, and I loved making extra money, so I’d go every Saturday from 9:00-1:00 A.M. The library was always quiet and I liked helping the patrons and taking care of their old documents. I learned a lot of responsibility during this time, namely that even if I’m tired or stayed up late the night before, I still had to be at work on time every time no matter what. College classes are great, but I think we can all agree that they don’t exactly teach real life skills very often. You can learn anything under the sun about finance, history, or English, but they don’t help when it comes to understanding how to behave in a workplace, how to deal with difficult coworkers, and how to recover from workplace mistakes. These are skills you can only learn on the job. My husband still says he’s able to speak to any type of patient today because of all his years as a waiter serving different type of patrons. My first college job paid $5.40 an hour and I was pretty stoked when I got a raise to $6.40 an hour. I enjoyed using my extra money to go to the movies, take a spring break trip, and in general, do as I please. Like I said, I’ve always hated asking my parents for money and my job gave me a sense of independence and accomplishment that I couldn’t achieve otherwise. As I stated, I’m a huge fan of young people working as soon as possible. I don’t think it takes away from their childhood or fun college days. Rather, I think it adds very important life skills that everyone can benefit from in the future. Did you have a job in college? What was it and how much did it pay? 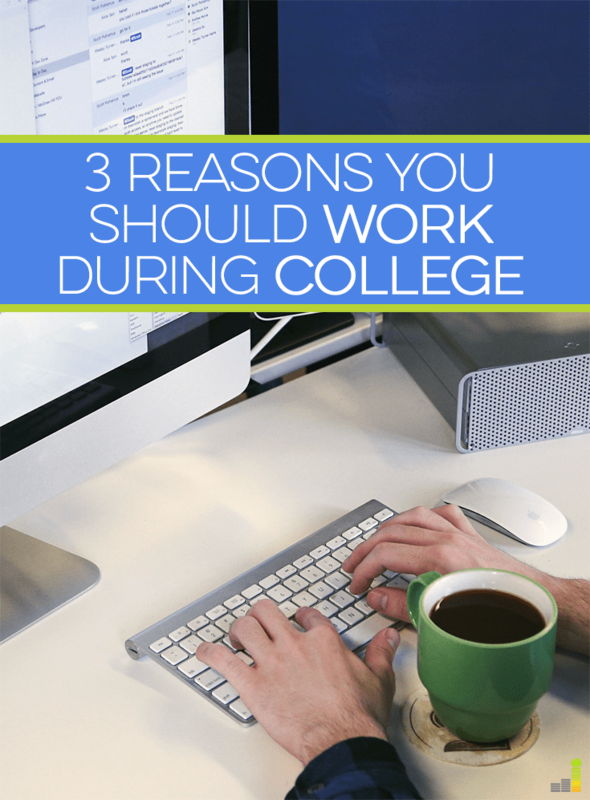 Do you think students should work during college? If so, why? What do you think it teaches them? 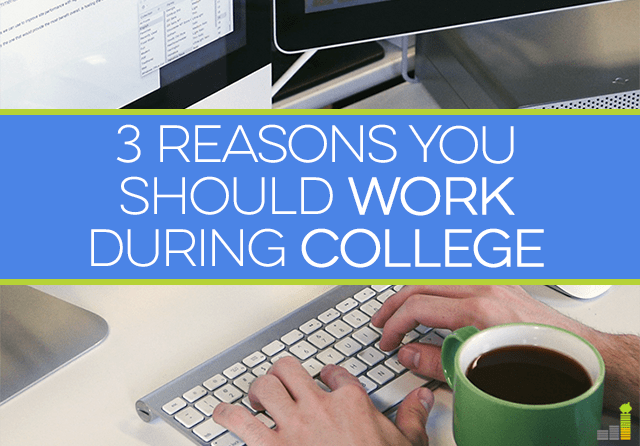 If you don’t think students should working during college or high school, what’s your reasoning? I worked at a convenience store in college which looking back was a big positive for me. I worked 20 hours a week and was able to work my way up to a shift leader which I believe played a role in landing a position after college because I did not have a lot of other experience in my field of choice. I think working in college is beneficial because it also keeps you uncomfortable. Since you have even less free time, you need to be conscious of how you spend it. Yes I think people who have jobs get better grades because they manage their time better. I can’t imagine not having worked in college. I had a couple of different gigs. Not only did they help me offset some expenses when I lived on campus, but they also helped build my resume. Plus, it made the transition to full-time work more seamless. I agree. A 9-5 can be a shock when people aren’t used to working! I was a college hustler (although I didn’t know the word hustle back then). I babysat, tutored, waited tables (at a convention center), worked as an RA, and often got tapped to do all kinds of odd jobs. Interestingly, except for the RA job, all my jobs were a type of self-employment. I remember wanting to earn $500 in a week because some friends were going on a trip the next weekend, and I didn’t have the cash to join. I probably worked 30-40 hours that week, but I made my goal (studying did not happen at all). That is so cool. Love that you had your entrepreneurial spirit back then! I think it’s good to work during college. I “worked” if you considered working 8 hours a week at the print shop on campus working. It was probably the most fun I’ve had “working.” In any case, it does teach you responsibility and how to manage money as well as give you spending money. My friends who didn’t work and just relied on mommy and daddy for spending money didn’t learn to budget…they asked for more when they ran out. I worked at an accounting firm in college, and believe that the experience I received was invaluable. I worked almost full-time and went to school full-time and I think it really helped me manage my time and excel in school. I learned responsibility, independence, and the ability to manage my own money. I may have missed out on some of the social aspects of college, but that was a choice I made. It definitely made me more financial secure for the future. I think all kids should work at least part-time in college. I always had two jobs during college! And it definitely builds character and helps make the “real” world after college not so bad (and actually a bit less hectic). I worked for the college as a student worker during the week – odd hours that I could change and fit in between classes. And then on the weekends I got up early and was a newborn photographer at two local hospitals. It was amazingly fun though difficult to always get up early on the weekends. I wouldn’t change it though if I could! Student worker jobs are great – as is the newborn photographer job – very cool!